What is it that makes you push for the last ascent, or surge ahead when you've reached the putative wall that faces runners in the marathon and what, on the other hand, is going on when you start to feel the weakening of the spirit and the sickening feeling that tells you you’re going to throw in the towel? Of course this spectrum of feeling applies to extra physical activities too and understanding instances where stamina is not simply a matter of physical strength or conditioning, throws a light on what accounts for the longevity that characterizes some individuals’s approach to human existence and the short tether on which others seem to hang—and also a whole host of responses in between. "Giving up" is the derogative term that's usually put on the failure to persevere, but it doesn’t really describe the complexity of the phenomenon. Firstly, there are those who are simply held back by unconscious forces out of their control. They have not dealt with their fear of winning and victory—which they may deem to be a triumph over the idealized parent whose retribution will be the withdrawing of love. That’s the classic oedipal view. But not all of human existence is defined by family dynamics. Sometimes triumph and failure can only be understood in terms of broader concept out of the lexicon of esthetics and religion, like for instance tragedy and fate. There's something divine in the spirit which propels a winner and something fearful and awe inspiring in the specter of the individual who fails in moments of potential triumph. 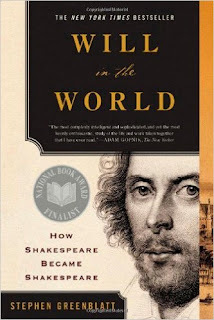 The double entendre in the title of Stephen Greenblatt’s book on Shakespeare, Will in the World: How Shakespeare Became Shakespeare will not be lost on those seeking to understand the limits of human striving.